Most families are worried about their aging parents living alone. That is why many individuals move them to an Elderly Care Home in Fresno, California where older adults receive necessary assistance for various activities of daily living. Creating a schedule on when your parents should take a bath will help them calmly anticipate what is going to happen. They can also prepare themselves for it. When setting a bathing schedule, consider your parents’ situation and needs. In most cases, they will not need full showers as their skins have already become sensitive. They may just need a sponge bath. The bathroom can be quite dangerous for older adults. So, it is important that safety risks inside it have been minimized or eliminated. Make sure to remove throw rugs that can cause your seniors to slip. All bath products suitable for aging skin should already be inside. Most importantly, check on the temperature of the water before letting your parents in. 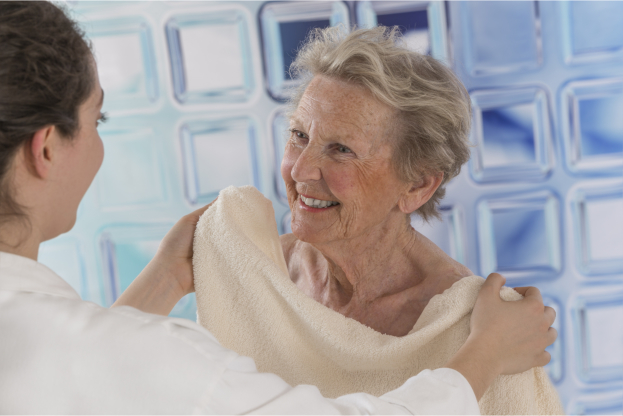 A Residential Care Facility will make sure that their bathrooms are senior-friendly. At times, your parents may get giddy or refuse to take a bath for a number of reasons. They may get agitated over simple things, such as running water. In this case, try creating a peaceful bathing environment for them. You can play music or use bathroom scents, whichever methods they prefer. Help them maintain a certain level of independence by allowing them to do the things that they can when bathing. If they can still apply soap to their underarms, let them do so. Take note that it may take quite a while for them to finish so be patient. Personal Services are available for them at any time they need them. Taking a bath is a personal activity and everything can turn awkward really quickly. As much as possible, do not talk about what is going on, unless you are giving instructions to help them out with the task. Talk about something else. Make sure to prepare their towels and clothes beforehand, too, so they can use them after bathing. Attentive Senior Care provides care and assistance to our residents in a safe, comfortable home. Give us a call today or visit our home!